A fast, easy way to brighten up your day is to take something (or someone you love) into the shower with you. Or both. When I say ‘meet me in the shower”, I really mean, take my hints about aromatherapy into the shower with you. So that could be really disappointing for some, and an absolute relief for others. 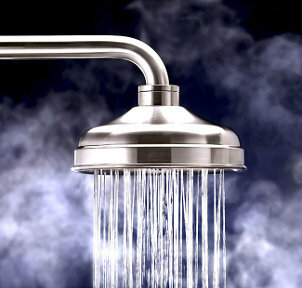 Steaming with essentials oil in the shower gives your entire being a blast of positivity. A few drops of essential oil will literally and figuratively open your mind. When the oils mix with the steam and are inhaled by you, the little molecules of scent will connect with receptors in your nasal cavity, the information being transported through different parts of your brain to effect change in hormonal glands, and in turn your feelings. They will also open up your nose, your facial sinuses, and make you feel alive! The best oils to wake you up will be peppermint, eucalyptus, rosemary, lemon, lemongrass and tea tree (among many, really). Essential oils have a bewitching nature that will surround and envelope you with their presence. It’s like a scented meditation and will set the mood of inspiration for the entire day. To be inspired is to be in spirit. To acknowledge your spirit via the fractal nature of essential oils will connect you to the beauty of the universe. I did a weekend workshop many years ago with In Essence, an Australian company founded by two sisters. Their recipe for showering with essential oils was to put 6 drops of oils in a 200 ml bottle, shake as you go and pour the water onto your body with the addition of a skin brush. Although I don’t do that everyday, occasionally it can be a real wake-up zinger! I prefer to use a body oil blend after the shower as its softer and more nourishing. When you do your essential oil steam you will need to cover the shower drain with a plug or a wash cloth, and simply drop some oils into the bottom of the shower recess. Depending on what oils you use, about 6 drops will be plenty. This entry was posted in Aromatherapy basics & how-to's, Essential OIls, Good things come from this and tagged aromatherapy, Australian eucalyptus oils, clear your mind, daily ritual, essential oil steam, essential oils, essential oils to wake up, eucalyptus essential oil, happiness, health, lemon essential oil, lemongrass, mentally, natural health, natural scents, peppermint essential oil, physicality, recipe, shower steam with essential ols, spirtuality, tea tree essential oil by suzannerbanks. Bookmark the permalink. It’s an easy method for sure Tim.